Back when the newest incarnation of Marvel Legends was first launched, Hasbro was still figuring some things out. The Captain America-themed Mandroid Series still had some troubles with distribution, and some…interesting choices in case packouts. The assortment was split into two waves. For the first wave, the Agents of Hydra swap figure’s packout was split evenly between Red Skull and the basic Hydra Agent. Both moved pretty quickly, but there was definitely more demand for the army buildable Hydra Agent. When the second wave hit, Hasbro decided to repack…Red Skull? And then the Hydra Agent never resurfaced, so finding one was a mean feat. 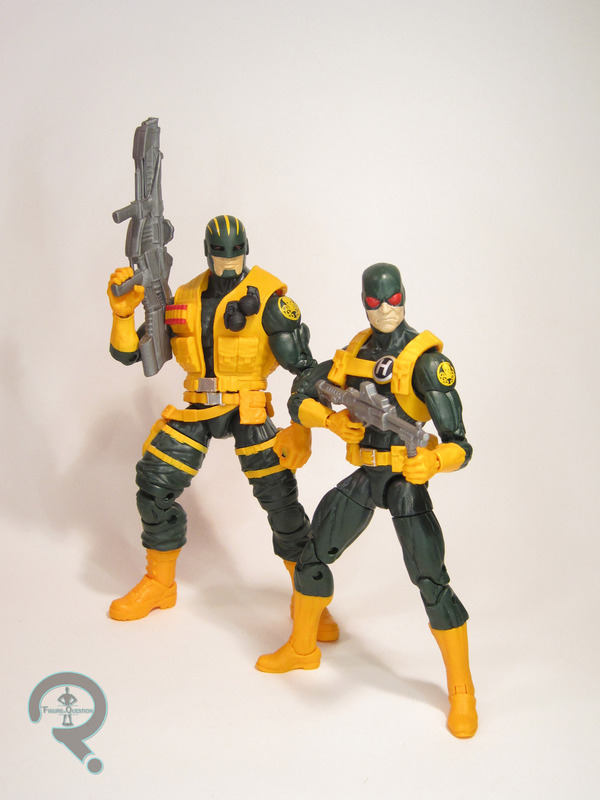 Last year, having started to learn from their earlier woes, Hasbro did a re-release of the Agent, alongside a new Hydra Enforcer figure, in an exclusive two-pack. The Agents of Hydra two-pack was a Toys R Us-exclusive offering under the greater Marvel Legends banner. It *was* a TRU-exclusive, emphasis on “was.” It was supposed to be released last summer, but apart from being on their website for exactly one afternoon, it never really showed up. And then, it sort of did, in the wake of all of the closing stuff. Now it’s made its way to Entertainment Earth, who have been grabbing all of the former exclusives. 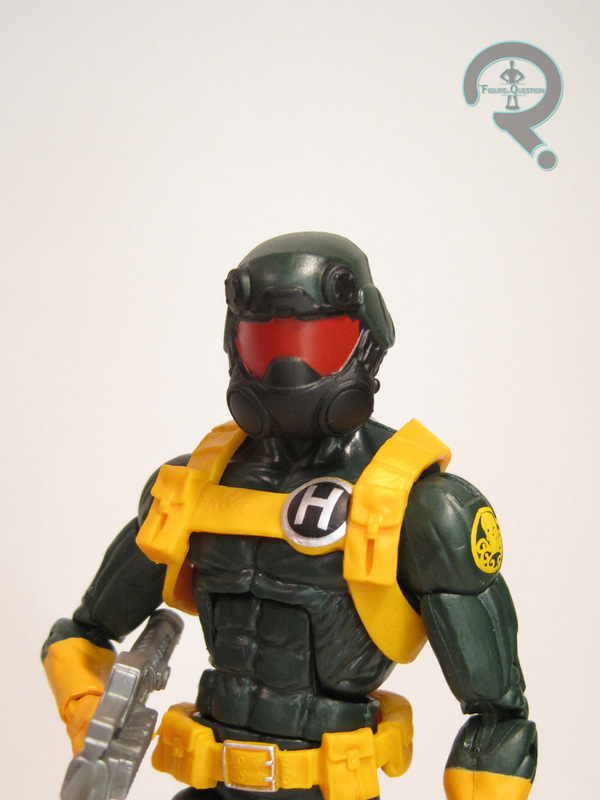 The basic Hydra Agent is, for all intents and purposes, a straight re-issue of the Mandroid Series release. He’s a more modern interpretation of the Hydra troopers, in the vein of Bob, Agent of Hydra. The figure stands 6 1/4 inches tall and he has 32 points of articulation. He’s build on the Bucky Cap body and he has add-ons for his harness and belt. Both pieces are unique to this figure and his predecessor. They’re well sculpted, and well fitted to the body. 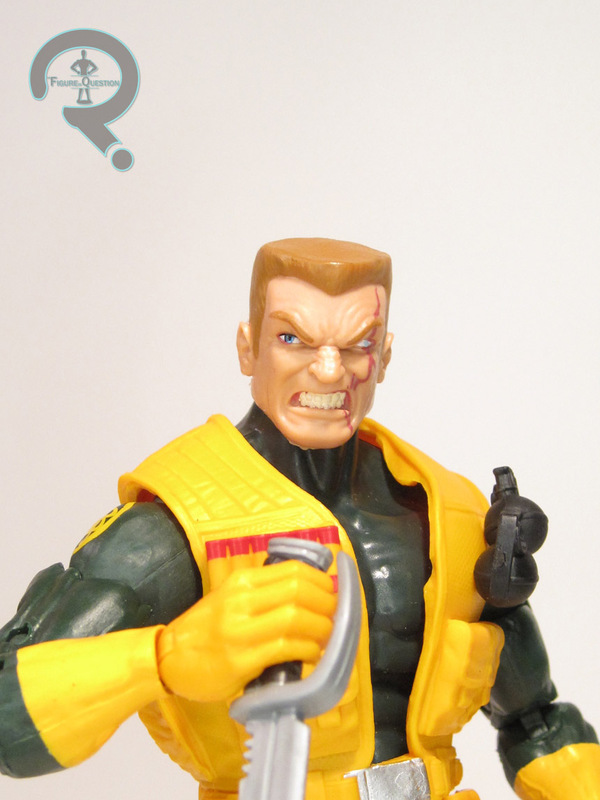 He’s also got a unique head, which is a good recreation of the Hydra Agent’s usual design. His paintwork is a point of marked improvement over the last release. Not only is the application a lot cleaner across the board, but he also gets a few more details, particularly the Hydra emblem on his shoulders. Also an improvement are his accessories. The last Hydra Agent included two rather goofy sci-fi-y rifles. This one instead gets two less goofy rifles, which look a lot better. He also gets a vest to swap out for the harness and and two extra heads. The first head is Taskmaster’s alt-head, recolored to match the Hydra soldier scheme, which is nice and imposing. 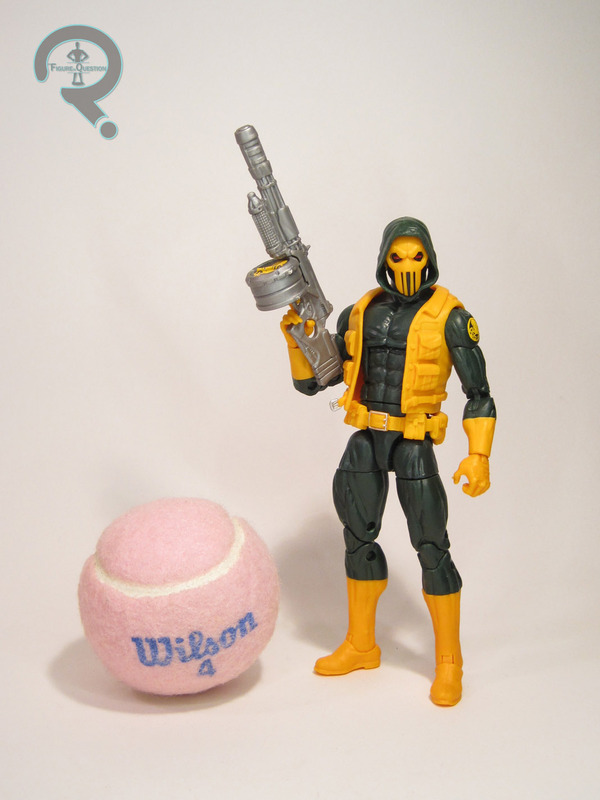 The second is the same one included with the Nick Fury figure from the Giant-Man Series. It all makes for a nice selection of options on this figure, which is especially nice for army building. The Hydra Enforcer is a newer concept, and seems to be the figure that’s actually being referred to in the bio on the back of the box. Despite being a new concept, the figure is just as much re-use as his pack-mate. He stands 6 1/2 inches tall and he has 32 points of articulation. The figure is built on the Hyperion body, specifically the Nuke variant of the body, with the pants and combat boots. He also gets Nuke’s vest and belt, as well as the head of Captain Britain, which works surprisingly well with the Hydra theme. The design presented by these piece complements the basic agent pretty well, and he seems to fit the overall Hydra aesthetic nicely. His paintwork is pretty similar to the standard agent, and the application is all pretty clean. 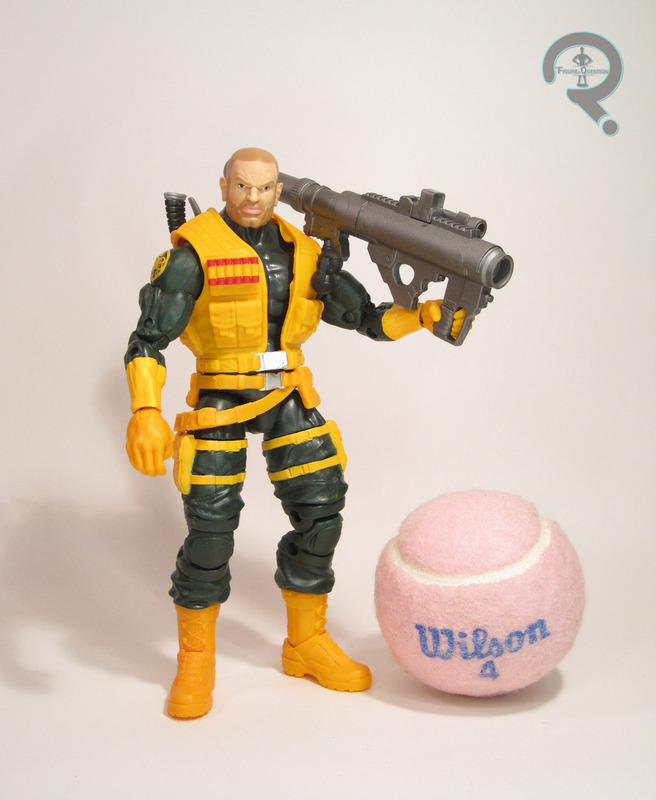 The Enforcer is packed with a large rifle (re-used from the AIM Agent), a missile launcher (re-used from Drax), a knife, and two extra heads. The first head is Nuke’s, matching the other pieces on the figure. It’s been re-decoed with a pretty intensive scar. The second head is re-used from Radioactive Man, done up with a sort of a Jason Statham look. Both are pretty fun, and far more specific designs than any of the basic heads, which I guess makes sense, since you’d assume the Enforcers are a more unique bunch. Having missed out on the original Hydra Agent release, I was definitely on board for this set. Of course, I couldn’t find it anywhere, so that all meant for nothing. Then I was going through my local TRU during it’s liquidation process, and there was just a stack of this set. Yay for me, right? It’s a solid offering, very definitely. It’s only real drawback is that it’s a little difficult to army build if you don’t want a bunch of Enforcers. Still, a very fun set, and I’m glad it’s finally making its way out to the people who want it.